By mid February, where we come from, the winter can seem endless. The days are a mix of grey skies and falling snow or sunny and cloudless with chilly winds and melting ice creating foot swallowing puddles along city sidewalks. 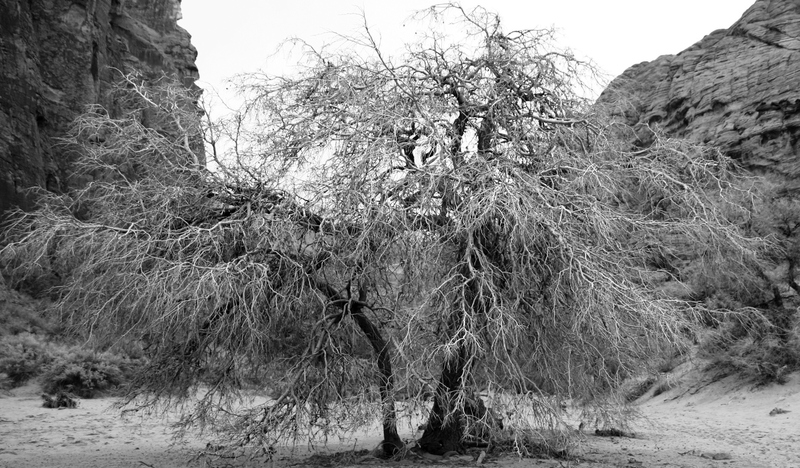 The mounds of snow that have lined the streets for months have lost their sparkle and shine and are now mottled gray and black, riddled with dirt and stones. The warmth of summer still seems months away as we continue to pull on toques and mitts each morning and weekends are spent waxing up the skis (again!) for the local trails. Around this time many friends and family jump on planes heading to far off beach resorts and exotic locales. 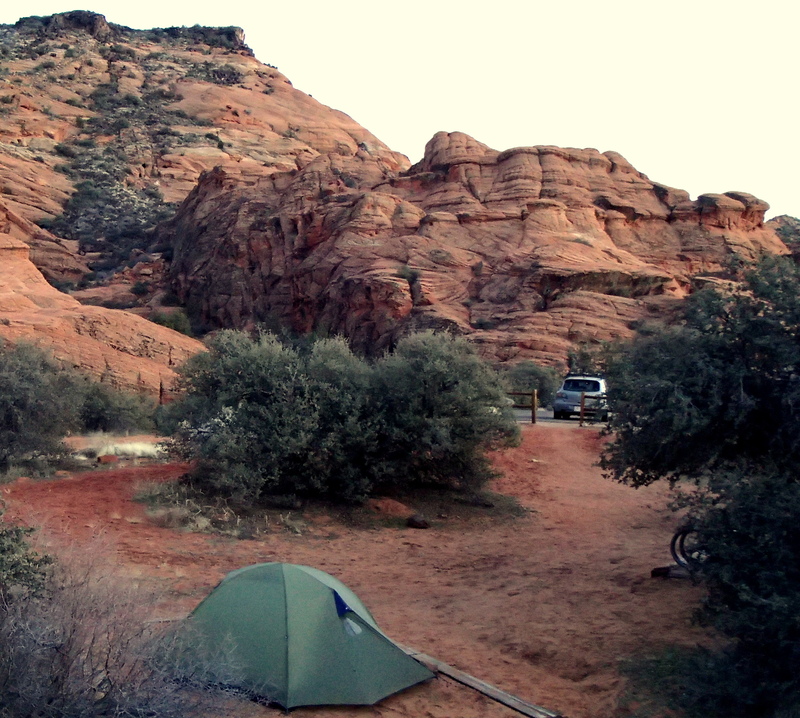 We prefer somewhere a little quieter, a little closer, a place to recharge our souls and give our bikes a little exercise; Southwest Utah, USA. 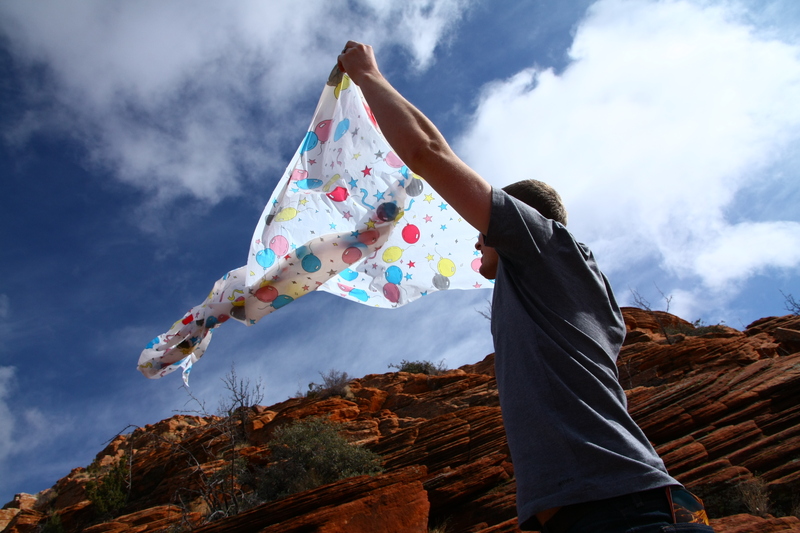 Southwest corner of Utah. Bottom far left corner of the map. This was our 4th time in the area. 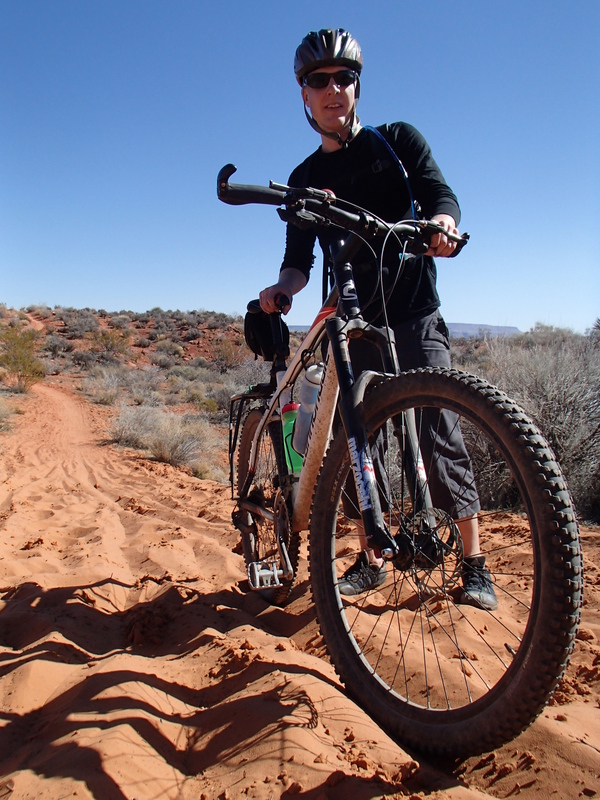 Having explored nearby Zion and Bryce parks before (definitely worth it) this time was dedicated solely to mountain biking the nearby trails. This beautiful area surrounding the towns of St. George and Hurricane lies at the edge of the Colorado Plateau, at the intersection of the Mojave and Navajo deserts and split by one of the largest continental fault lines in the world. This creates an amazing contrast of soaring red mountains, deep narrow canyons, flat-topped mesas and long valleys of old lava flows. It also has some amazing single track! Below, some of the pictures and details of our rides of the week. 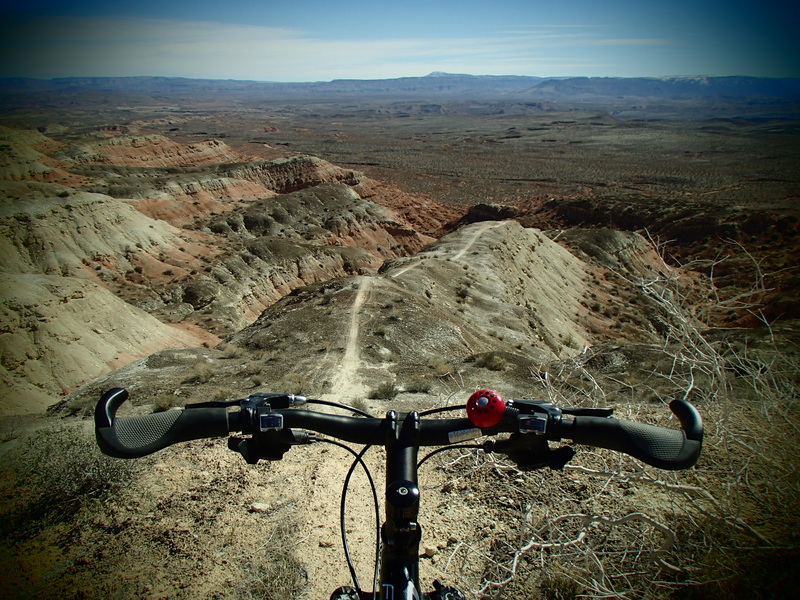 The Bearclaw Poppy and Stucki Springs trails lie on the west side of St. George, easily accessible through residential roads. These two trails combine to make one long, flowy, beginner to intermediate track. Not much technical here, just fast single lines, fun quick up and downs and a few steep hills, along with views of the desert. Great trail to start out on. Approximate distance: 20-25 miles for the full loop. Deep sand on Prospector trail. The beginning of one amazing loop. 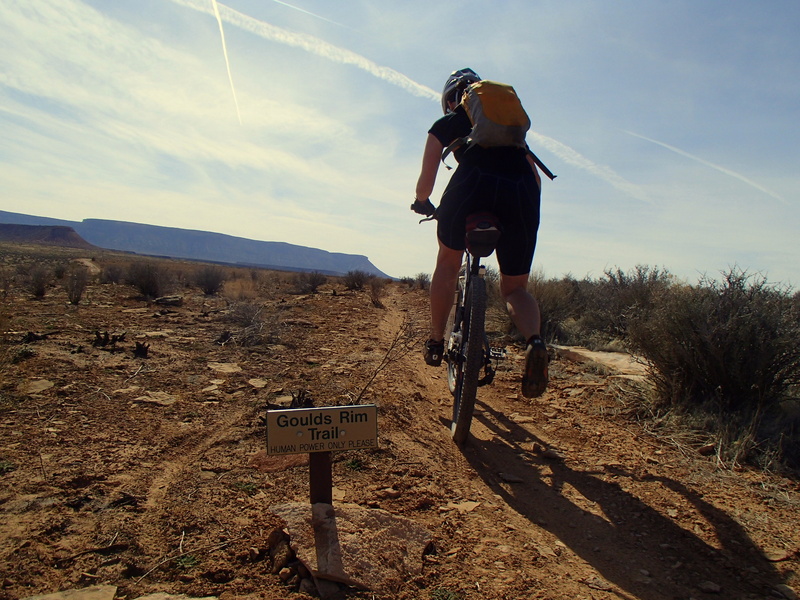 This easy trail starts at the Anasazi trailhead in the Santa Clara preserve just west of St. George. 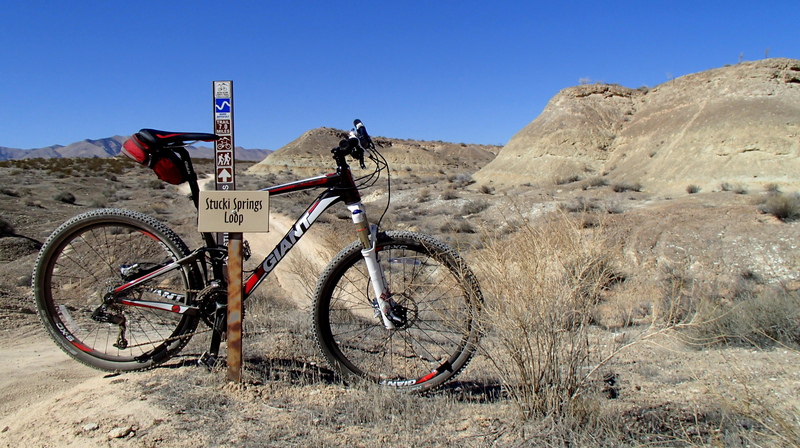 The actual singletrack is called Tempi’po’op, a fun route that skirts along the cliff with views of the preserve and the Santa Clara river below. This area is only beginning to develop trails and will probably see lots of changes in the near future. Meanwhile it’s a great warm up for more challenging trails nearby. 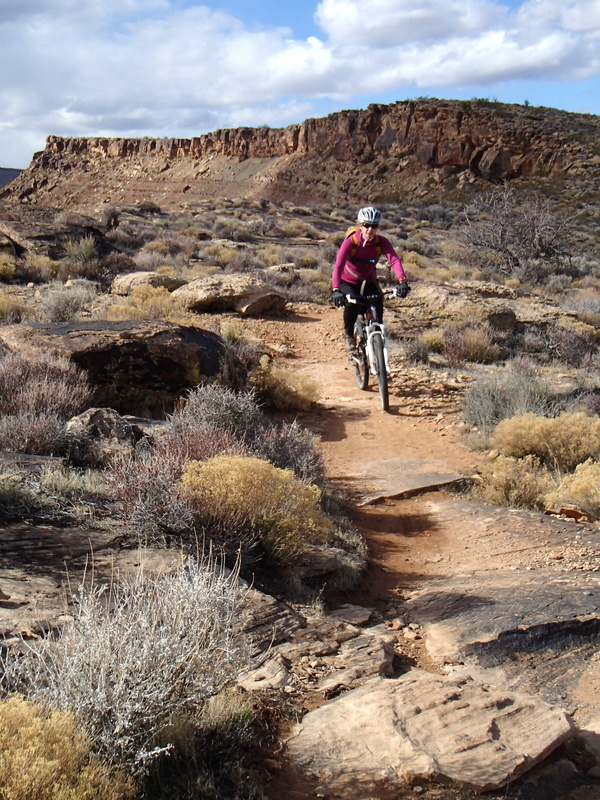 We pedaled a short distance east along the highway after the Anasazi trail to try out this loop. The access to the trailhead is up a steep grind of a gravel road. We ran into some locals at the top who raved about the trail (not the first time we had heard this) so apparently the climb is worth it. 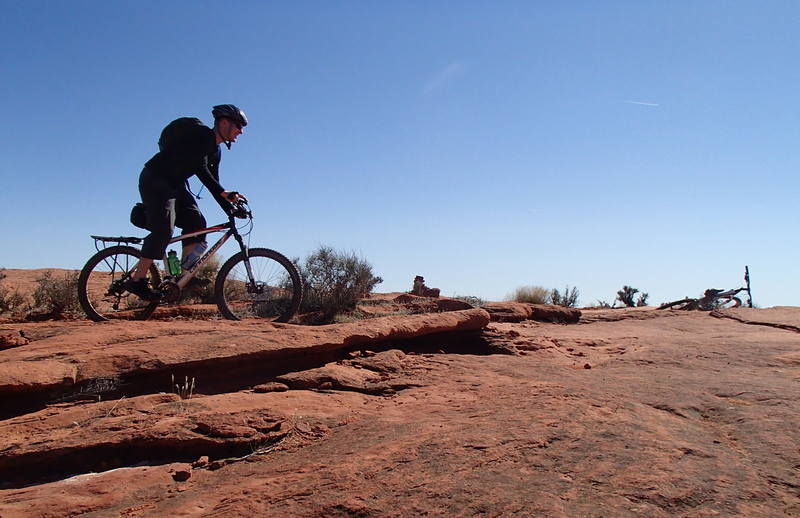 The first part of the loop is a blast; nice flowy singletrack, moderate climbing, short technical sections of ledges and slickrock. Unfortunately the sun was setting and by this time we had had two flat tires (watch out for all the cactus thorns!) so we had to leave the second half of the loop for another trip. We are quite sure though it would be just as fun. Midway through our trip in Southern Utah we woke up to a slightly collapsed tent and a thick wet blanket of snow covering the ground. 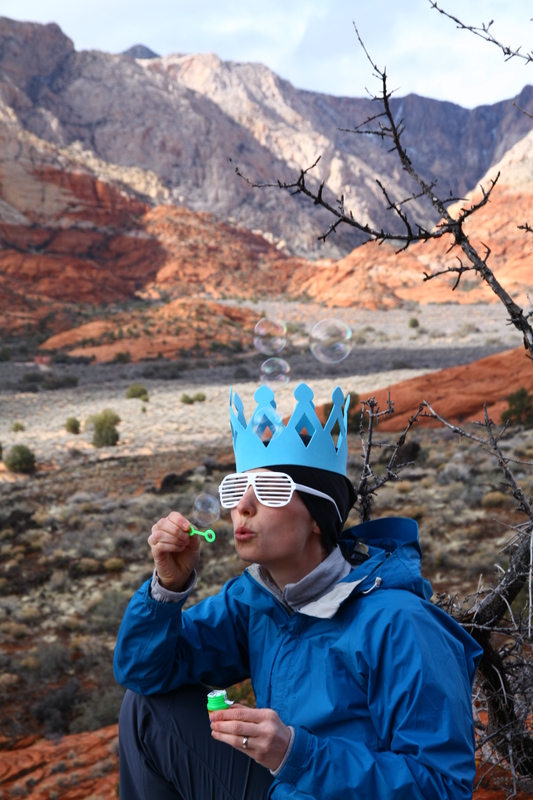 A day of hiking was declared as well as a celebration of a birthday. 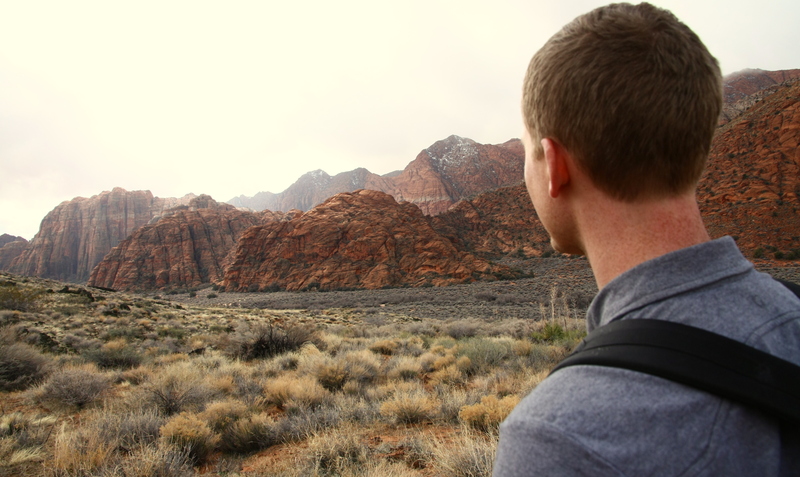 Snow Canyon has numberous trails of varying intensity, trails that take you to high up viewpoints and others that wind through washes with the soaring walls of the red mountains on either side. View from Cinder Cone trail. The trail passes through lava rocks to an extinct volcano and deep crater. A week of biking, camping, hiking and soaking in the sun. A much-needed break from the long northern winters…now if only all this snow would melt back home! Restaurant: Benja Thai & Sushi – great Thai curries (we normally camp and cook over our stove so our experience is limited). 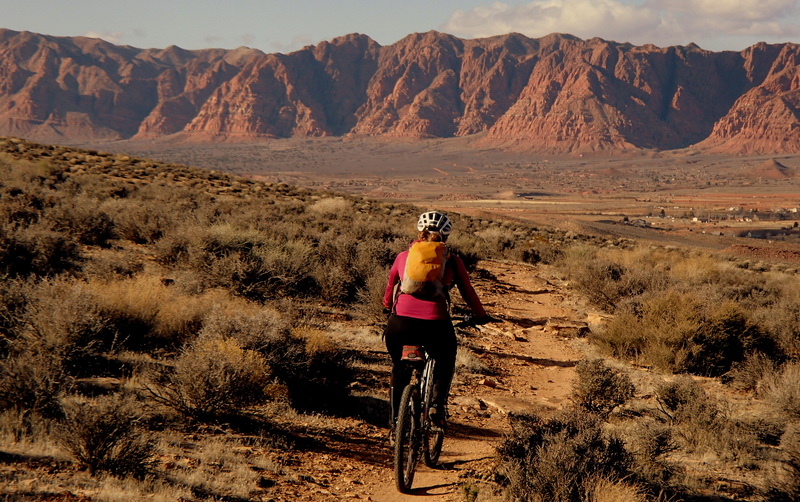 This entry was posted in Mountain biking, Utah and tagged mountain biking, singletrack, Snow Canyon State Park, St. George, Utah. Bookmark the permalink. I hope you have a joy-filled day and are spoiled as you well deserve. Soon there will be three doctors in your birth-fam…which is admirable…all in distinct disciplines of thought…wouldn’t Papa be overcome with pride at the accomplishments of you, Alex and your Father.